Oyster mushrooms are fascinating fungi that can grow on many different substances, from hardwood logs, wheat straw, coffee grounds, or even old cotton clothing. In the developing world, oyster mushrooms are bringing families without agricultural land, out of poverty, giving them a product that they can sell in the market, improving their standard of living. 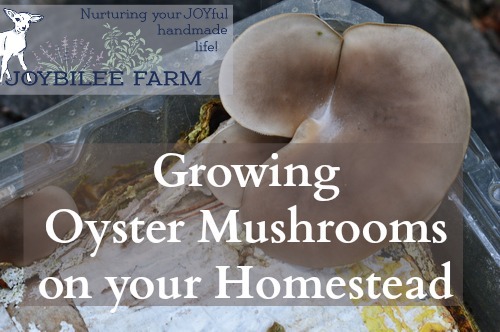 A lot of research has been done on different methods of growing oyster mushrooms that can help you, as a backyard homesteader, to grow these amazing fungi. Oyster mushrooms are both culinary and medicinal, containing high amounts of immune boosting beta glucan and triterpenes that support the body’s stress and adaptive responses. In the International Journal of Oncology, Jedinaki and Silva (2008) identify two molecular mechanisms from oyster mushroom extractions that “specifically inhibit growth of colon and breast cancer cells without significant effect on normal cells, and have a potential therapeutic/preventive effect on breast and colon cancer.” Oyster mushrooms are high in B vitamins and folic acid. They are also antibacterial, inhibiting pseudomonas, E. coli, and staph bacteria. 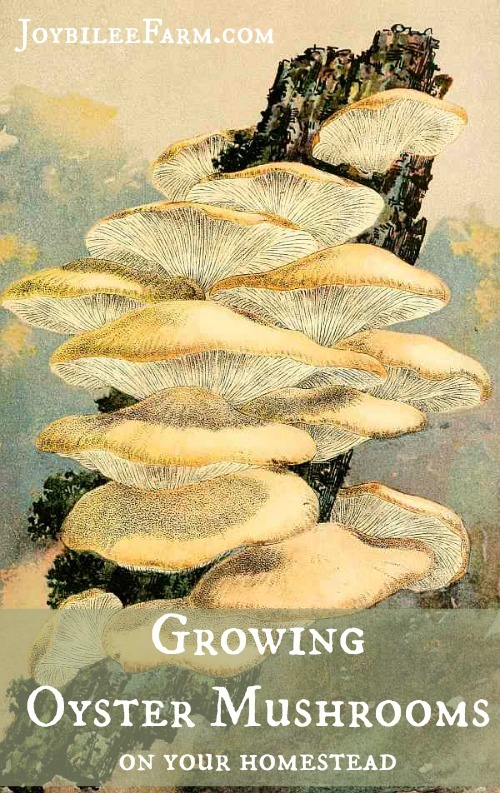 For more on the health benefits of Oyster mushrooms see this Huffington Post article by Paul Stamets, author of Mycelium Running: How Mushrooms Can Help Save the World. Of course, oyster mushrooms, like all mushrooms, should be cooked before eating them. In cooking they function the same way as more familiar white button mushrooms, crimini, or portobellos, so you don’t need any specialized cooking skills to utilize your harvest. Fry them in a little butter and add them to pasta, meat dishes, or top a pizza with them, and you’ll be on your way to enjoying their health and nutritional benefits. Best of all, when you grow your own oyster mushrooms you can perpetuate the mycelium, your mushroom starter culture, much like sourdough. This was new information for me. Your initial starter mycelium can be grown out on sterilized medium like wheat berries or rye, so that your starts of oyster mushrooms can continue for a long time. Keep your containers of starting medium sterile and add the mycelium in generous amounts and your oyster mushroom mycelium will be strong and prolific. I recently listened to a talk by Tradd Cotter, where he talked about perpetuating a bin of oyster mushroom mycelium by dividing a starter mix into 10 parts and perpetuating it. Each week, take the strongest of those and begin another 10 bins, while allowing the former 9 to populate their substrate and fruit out. Your original 9 will produce edible mushrooms in about 4 weeks. And will produce a second flush of mushrooms a week or two after that. The size of the harvest is dependent on the amount of growing medium. But generally 1 lb of growing medium will produce ¾ to 1 lb. of oyster mushrooms. In this way your small beginning of oyster mushroom mycelium can generate hundreds of lbs of mushrooms in a few months. Oyster mushrooms can grow on waste paper, wood shavings, straw, and spent coffee grounds, so the expense is minimal for the rich source of protein and neutriceuticals they offer. Check out the waste in your recycling bin and see if you might have the beginnings of an inhome mushroom farm, just waiting to be exploited. Today, my recyling bin contains toilet paper rolls, printer paper, and cardboard boxes, while my compost pail contains spent coffee grounds and egg shells, all ideal oyster mushroom growing medium. You can also grow oyster mushrooms on hard wood logs, much like shiitake mushrooms. Use spawn plugs or sawdust mycelium to inoculate logs and wait 3 to 6 months for the spawn run. The plug spawnare easier to use than the sawdust, if this is your first experience innoculating mycelium in logs. The spawn run is dependent on the size of the logs and the relative humidity and temperature. When the spawn run is finished you’ll notice white splotches on the sides and ends of the logs. This is the mycellium, the tiny roots of mushrooms, drawing nourishment from waste wood. Mushrooms won’t fruit until the spawn run has used up all available nourishment in the growing medium, whether logs or other medium, like straw or coffee grounds. Once the mycelium has fully impregnated the medium, the oyster mushrooms will fruit. Oyster mushrooms are aggressive and will fruit in 3 to 6 weeks from spawn run. Why didn’t we know about this before? Think of all the mushroom harvests we’ve aleady missed. My research into Oyster mushrooms has me intrigued enough to find an internet source of oyster mushroom mycelium. Well, I found out that it’s not so easy in Canada. Mushroom mycelium is a living thing, and so you can’t just order it on Amazon.com and have it sent across the border. There are only a few places in Canada to order mycelium. I ordered mycelium from Mycosource in Ontario. There is also an exciting store in Montreal, Mycoboutique. On the other hand, for oyster mushrooms at least, you can grow mycelium from the stems of the store bought oyster mushrooms. 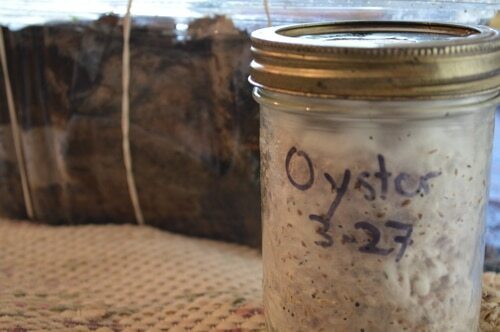 See my post on growing mushroom mycelium from store bought oyster mushrooms. Check out this video for instructions on growing out mycelium from oyster mushroom stems. The technique in this video isn’t perfectly clean and he does end up with some spoilage. While there are risks of failure in beginning this way, at least it’s a cheap way to get started. If you live in the USA, on the other hand, Amazon is a rich source of mushroom spawn, mushroom sawdust, and mushroom plugs. Lucky you! If you live in Hawaii, you may need to start with an oyster mushroom or an oyster mushroom kit. Rather than grow out the kit though, open it up in a sterile environment and divide it between sanitized substrates to get your mycelium running. Many years ago I purchased an oyster mushroom kit from Richter’s Herbs. It was a bag of sawdust and oyster mushroom mycelium that came with minimal instructions. Oyster mushrooms need a little bit of light when fruiting but they don’t want direct sunlight. They need to be misted 2 or 3 times a day to fruit properly. As well, they give off carbon dioxide and need an exchange of fresh oxygen while fruiting so that the fruit is not misshapen and dwarfed. Ideally grow your oyster mushrooms in the bathroom or another high humidity area, and have a fig tree or a lemon tree growing next to them to offer more oxygen, if you aren’t growing them outside. I got only 1 harvest from my kit and then my buttons didn’t mature in the next flush. Back then, I decided that growing mushrooms was too hard to do at home. I think after doing this little bit of research I’m ready to try again. I’m intrigued about growing oyster mushrooms on ragged blue jeans. I’ll let you know how it goes. I did it! Here’s my first flush of oyster mushrooms grown on cardboard and coffee grounds, in a plastic salad box. I started these with a tissue culture from store bought oyster mushrooms. I cultured them on grain for 2 generations and then used the grain to innoculate a sterilized box of coffee grounds layered with newspaper. It took quite a few weeks and then one morning I looked and this is what I found. So cool! Growing food from waste! If I can do this, you can to. Update: We got 3 flushes of oyster mushrooms from this box of coffee grounds and paper waste. Then I tossed it into the garden and it produced another flush of oyster mushroom the following spring. Novice question: We are going to cut down several mulberry trees with trunks about 8″ in diameter. and leaving a 3-4 ft. trunk for growing oyster mushrooms. I heard they like mulberry. We’ll continue clipping any sprouts so that the tree dies. Should one add spawn immediately or wait? Thanks. The living tree produces antifungal constituents that will prevent mushrooms from colonizing. Usually we wait 2 to 4 weeks for these to stop before inoculating a stump with spawn. How Can I order BLUE OYSTER MUSHROOM growing kit from Istanbul ? Where is the info on the third video? Did I miss it? I need to know what to do after you get a jar filled with the mycilium coffee grounds and straw? I got so excited telling my husband about this. He wanted to know if any of these might work with shiitake or portobello mushrooms? I tried the log inoculation thing with shiitakes long ago as a part of a Master Gardener class but it failed. Log cultivation or oak sawdust on shiitake. Portobello are just overgrown button mushrooms that grow in manure compost. 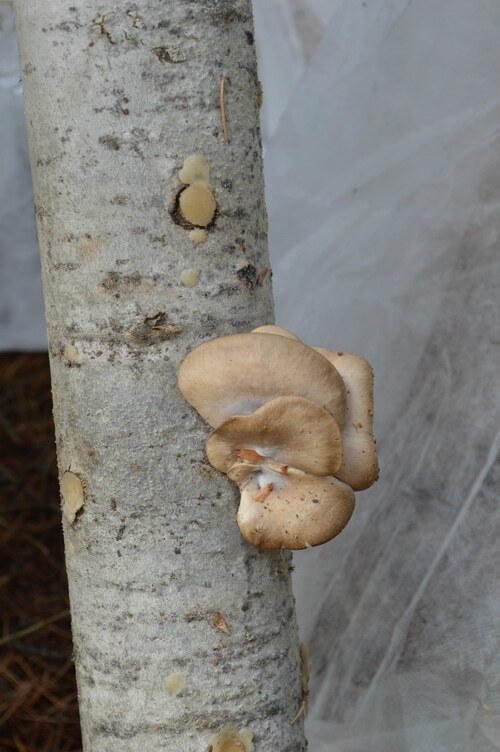 Oyster mushrooms are the most adaptable to different substrates. This is great! I’m growing some oysters in a bucket right now on corrugated cardboard. They’re growing right now, but seem to be kind of stuck in a pre-flush limbo…some of the heads are looking large but haven’t unfolded yet, and they’ve been like that for a few days. I’m worried that they will just harden up and not grow to a full size – any recommendations here? I have the top open so sunlight can get in, with a plastic bag over the top to retain moisture. But my house is pretty dry, and it stays steady at about 60 degrees F. Thanks! Anything helps. Are they getting lots of oxygen? Mushrooms give off carbon dioxide but need oxygen to fruit. You could try misting them, twice a day, too. I bought a button mushroom kit and had some sucess years ago. I just bought oyster mushroom plugs last fall. Broke my leg and then foot surgery on my other foot, they are still in the fridge. 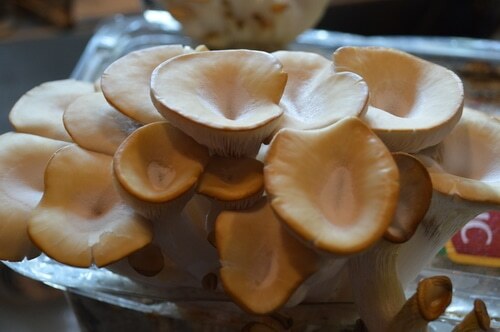 I in the meantime bought a box of oyster mushroom spawn. No luck with that yet, but I am going to try it with coconut husk. Wish me luck. I took my kids old sand box and filled it with black dirt, compost, and morel mushroom spawn. Can’t wait to see what April showers provides. Thanks for sharing your journey. I bought a button mushroom kit and had some sucess years ago. I just bought oyster mushroom plugs last fall. Broke my leg and then foot surgery on my other foot, they are still in the fridge. I in the meantime bought a box of oyster mushroom spawn. No luck with that yet, but I am going to try it with coconut husk. Wish me luck. I took my kids old sand box and filled it with black dirt, compost, and morel mushroom spawn. It has been outside all winter working. Can’t wait to see what April showers provides. Thanks for sharing your journey. That sounds like so much fun. Let me know if you are successful. I found your link on Pinterest, and just love this post. It’s wonderful to be able to grown your own mushrooms. We’re ordering spawn and starting our own mushroom endeavor, too. Thanks for a great read. I’d love to hear more about your mushroom endeavor. Did you blog about it? Off to see if I can find a post on your blog.